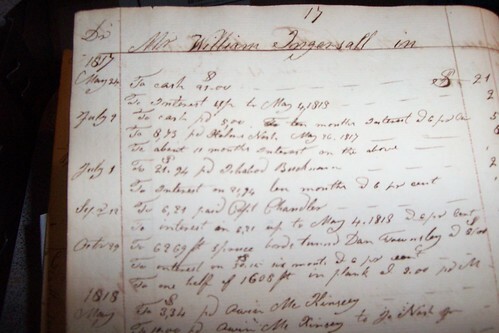 Over this past year, I endeavored to return a family heirloom that my mother had passed on to me before she died – a business ledger prepared by my great, great, great grandfather beginning around 1813 – to the town of Columbia Falls, Maine, from where it had originated over 200 years ago. 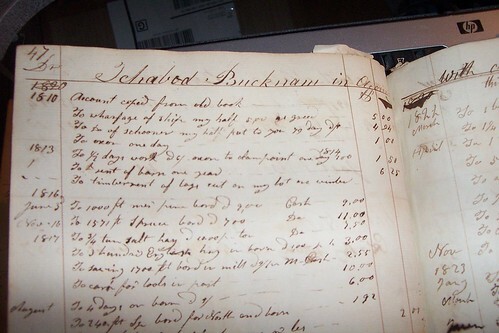 The ledger was all hand-written (of course) in ink that had faded a lot in places, but it was quite a historic record of the accountings of Nathan Bucknam’s business. I’d had the ledger for over 10 years here at Crow Cottage, but since I don’t have children and, since my brother and sister had never shown much interest in the historical aspect of our family, I thought that the ledger should be placed somewhere where historians would keep it safe and and would be able to use it in their studies of the history of the area. My maternal grandmother, Francis Bucknam Ingersoll Washburn, whose maiden name was Ingersoll, grew up in Columbia Falls, Maine. She acquired the ledger from her mother, Lucy Ella Bucknam Ingersoll. It is through her family of Ingersolls that I came to be related to Susannah Ingersoll, Nathaniel Hawthorne’s cousin, of Salem, MA, whose house is said to have been the model for The House of the Seven Gables written by Hawthorne. Learn more about the current House of the Seven Gables on Facebook here. 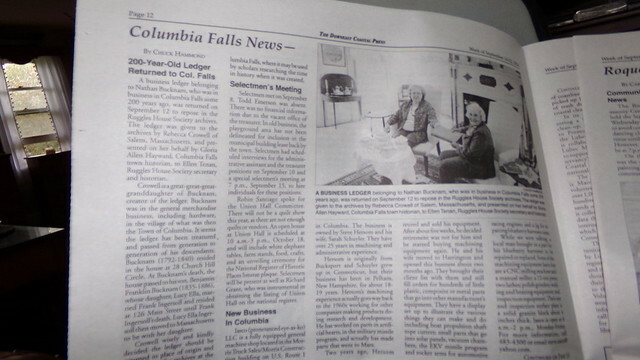 The following was from The Columbia Falls News of this past fall. Scroll down a ways til you reach “Columbia Falls News by Chuck Hammond. A business ledger belonging to Nathan Bucknam who was in business in Columbia Falls some two hundred years ago was returned on Friday, September 12, 2014, to repose in the Ruggles House Society archives. The ledger was given to the archives by Rebecca Crowell of Salem, Massachusetts and presented on her behalf by Gloria Allen Hayward, Columbia Falls Town Historian to Ellen Tenan, Ruggles House Society Secretary and Historian. Mrs. Crowell is a great, great, great granddaughter of Nathan Bucknam, creator of the ledger. Nathan Bucknam was in the general merchandize business including hardware in the village of what was then the Town of Columbia. 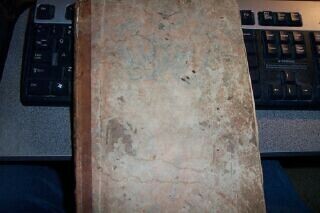 It seems the ledger has been treasured and passed from generation to generation of his descendants. Nathan Bucknam (1792-1840) resided in the house at 28 Church Hill Circle. At Nathan’s death the house passed to his son Benjamin Franklin Bucknam (1835-1886) whose daughter Lucy Ella married Frank Ingersoll and resided at 126 Main Street until Frank’s death when Lucy Ella moved to Massachusetts to be with her daughter. Mrs. Crowell wisely and kindly decided the ledger should be returned to place of origin and it will be in the archives at the Thomas Ruggles House in Columbia Falls, where it may be used by scholars researching the time in history when it was created. A business ledger belonging to Nathan Bucknam who was in business in Columbia Falls some two hundred years ago was returned on Friday, September 12, 2014, to repose in the Ruggles House Society archives. The ledger was given to the archives by Rebecca Crowell of Salem, Massachusetts and presented on her behalf by Gloria Allen Hayward (left), Columbia Falls Town Historian to Ellen Tenan, Ruggles House Society Secretary and Historian. I meant to write about this earlier but forgot to do it. I am happy now to know my family’s 200 year old ledger is safe in the hands of the people of Columbia Falls, back where it originated all those many years ago. You can read more about the Ruggles House Historic House Museum here. Here I am playing catch up again! That was a wonderful gesture. It isn’t safe to leave such treasures with people who might not care about them. So much is lost that way. I am sure you really pored over the ledger before releasing it. It’s really the kind of thing that tells about the way people lived, that history books often neglect. Sure a wonderful gift you gave them !!! That was nice of you, to return that ledger to its hometown. And great pic, BTW! Nice to see you looking so healthy and happy. Congratulations on your generous donation Bex! Love the photo of you, thanks for posting it! You look young to me, I guess it shines from the inside out! Oh OK, Nina! Since I gave you grief today with your comments, I’ll throw in a fairly recent snap of me, maybe a couple of months ago… ok? Are you satisfied? Now do you see why I don’t advertise? And no, I wasn’t down Maine for the handover of the ledger, that was the historian and another lady, mentioned in the caption below the picture. That was a very nice thing to do. Care taken to keep the history alive and well. Good job Bex. Very thoughtful and correct in returning the book to the town where it truly belongs. I have children and grandchildren so my historical artifacts have people to hand them on to. I have spent time taking people places and talking to my family about its’ history. I am considered the family historian on my paternal side so much has been passed on to me. I also have a number of treasures from my maternal side. I am glad you decided to share yours with historians and towns members. Bex, that is definitely cool. You were very wise to go ahead and make this gift.